SickBrick is an action-oriented Sci-Fi FPS with vivid graphics and old school gameplay. The game consists of 15 levels mixing indoor and outdoor areas. You’re forced to do tests for an unknown robotic mastermind. Destroy hundreds of hostile robots with a wide variety of weapons on a strange alien planet. Jump in a hover-tank and wreak havoc on giant boss enemies. As you go through the tests, you slowly unravel the story through log files of previous test subjects. 15 maps with a mix of outdoor and indoor locations on a strange alien world. 5 unique and devastating weapons. Chainsaw, Shotgun, Lightning Gun, Grenade Launcher, and the Shock Rifle. 10 deadly robotic enemies each with custom animations and sounds. Vivid graphics reminiscent of the golden years of first person shooters. Advanced graphical technologies like depth of filed and screen space ambient occlusion. Includes MapEditor and ResourceEditor for creating custom maps and mods. Hello, I'm Mladen Bošnjak. I created SickBrick and made all of its models, textures, story, animation and maps. Ron "Maxwolf" McDowell did the programming. 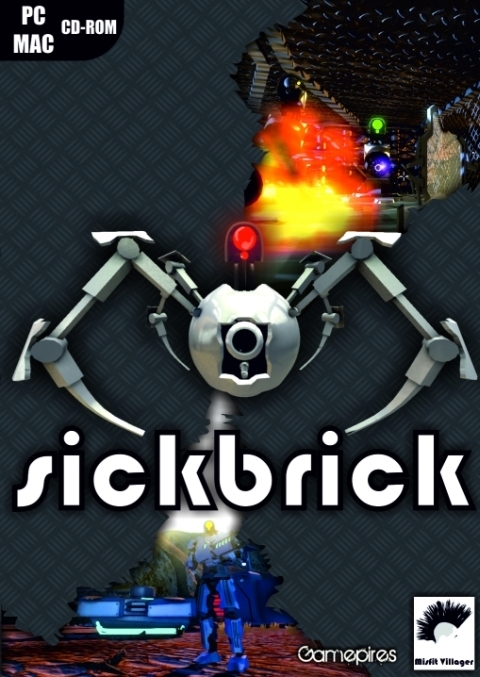 We published SickBrick on Steam in January 2015. Maxwolf signed the agreements with Valve and the money goes through him first since he is in Canada and I'm in Croatia and it's a lot easier for him to set up payments, taxes and so on. In December 2016 Maxwolf removed my access from SickBrick on Steamworks, so I can't see the revenue, generate keys or do anything related to SickBrick. He also stopped sending me my cut of the money earned from SickBrick and is not replying to any emails. so I'm asking you, the lovely people of IndieDB, for help. 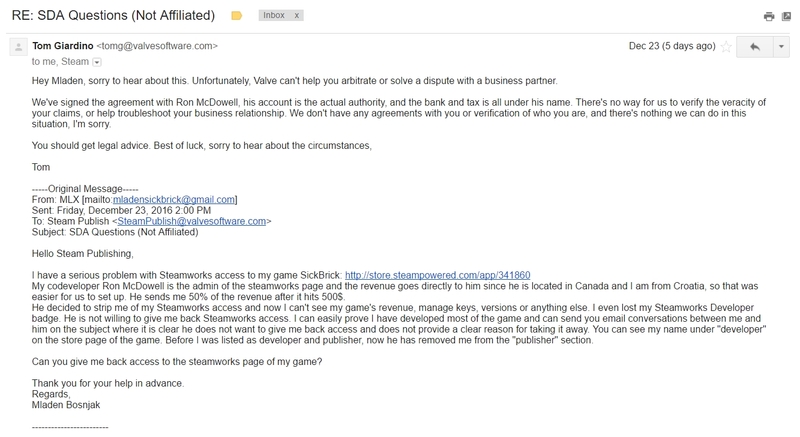 In an attempt to get Maxwolf talking and to convince Valve I'm the principal developer of SickBrick, I wrote an open letter in which I explain the events that transpired leading to me being stripped of my game and the revenue earned for it on Steam and other places. SickBrick has been released on Steam! Our very own rocking SickBrick just got greenlit for a Steam release! The first stroke of good luck with SickBrick! And it's been out for more than a year. SickBrick Price Cut - Now $4.99! SickBrick's price has been sliced in half and is now only $4.99. The reason why and other news and ramblings inside. What a great idea to release also the editor for this game!!! This way people can make there own levels or even complete mods which will make that people can enjoy the game even longer. A shame that a lot of games these days don't suport this anymore, back in the years nearly all games had tools released to make your own stuff with it. So, great choise, thanks for that! Hi, I just picked up this game. Looking for any games like portal and this one has similarities. I appreciate supporting linux even though its using wine. I hope the engine port to linux reaches completion and that this game makes it to steam and steam for linux. Thanks for not making another multiplayer arena deathmatch. Quite offended that you consider a "wine wrapper" to be Linux availability - I find that to be false advertising and am quite upset by this. If you're going to say it's available on linux, you shouldn't embellish things. Wine compatibility isn't linux availability, not even close. We are deeply sorry you feel that way. It is stated right in the description of the game and on the demo description that it uses s wine wrapper to run on Linux. There will be no full linux support if the developers of NeoAxis (the engine the game was built on) don't add support for linux. If that happens, a full linux port will be developed. It should be noted that the SickBrick devs are actually trying to get information from NeoAxis regarding their Linux port (a NeoAxis dev did a bunch of nice work a couple of years ago, but not much on that since then). It's not like they don't care... I was trolling the NeoAxis forums and came across a question from these guys about the Linux engine port, but nobody replied to them (except another dev, wanting to get support for making their game's dedicated server work on Linux!!). For an indie developed game, it has really nice rendering and graphics. The atmosphere of the game is pretty good too. However some models don't look too right, but its neglible. Just waiting on a native Linux release now.